Ear infection symptoms are more likely to affect children than adults, though the cause of most ear infections is a build-up of fluids in the middle ear. Because many children who are too young to speak will experience ear infection symptoms, it is important for parents and caregivers to recognize non-verbal cues. Ear infection in infants normally require antibiotic medication and it’s recommended you get your child to a doctor as soon as possible. If symptoms last longer than a day or fluid is draining from your ear – it’s recommended you see a doctor. 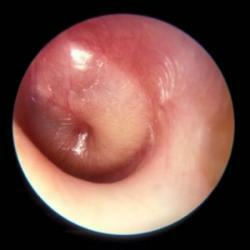 Getting immediate care for ear infection symptoms will shorten the duration of pain and discomfort they cause. Find the FastMed location nearest to you and simply come by – we’re a walk-in clinic. No appointment necessary, particularly important if you are dealing with a sick child. We accept most forms of insurance and are open 365 days a year. The normal course of treatment is an examination of the middle ear using a pneumatic otoscope and a prescription for antibiotics if needed. Please remember, when taking medication it is very important to continue through the entire prescription – do not stop taking your antibiotics when you start to feel better.